HISTORY OF CANON BOOT ROMS - There are two generations of boot rom assemblies used in Canon ImageRunner machines. The first generation, used in machines such as the IR400, used 5 volt (5V) flash memory chips. All of these boot roms assemblies used a two chip design. The chips used on first generation assemblies were 4, 8 and 16 meg parts (Example:29F040A). (NOTE: The first generation boot rom adapter (#AC8B72) is not included in a kit but can be purchased separately.) The second generation boot roms, used in machines such as the IR5000, use a newer low voltage (LV) memory chip. These assemblies will use a one or two chip design. The chips used on these assemblies are 4, 8, 16 and 32 meg parts. (Example: 29LV160T). The second generation boot rom adapter (#ACDM72A) is included in Canon Kit#1 and Canon Kit#2. HISTORY OF CANON COUNTER AND ECO/ID ASSEMBLIES - The first Canon counter assemblies used 28 pin parallel eeprom technology parts. The first counter assembly used a 2K (2817) part which was followed by an 8K (28C64) part. 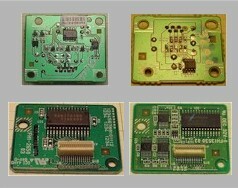 As eeprom technology tends to degrade with usage, Canon switched to FRAM parts which do not degrade with usage. All parallel FRAM parts used by Canon are 32K and include the MB85R256, 28V020 and FM18L08. Note that on one counter assembly the 32K FRAM is hard wired for 8K. Andromeda Research includes a special device (CANON18L08) which is used with this assembly. Canon also uses serial (8 pin) FRAM parts as counter chips on certain assemblies such as the FM24CL64 which is an 8K part. The first Canon ECO/ID assemblies use a 128 byte 8 pin serial eeprom (LC46). Later ECO/ID assemblies use a 1K part (L76). Canon Kit#1 includes the programming unit, Canon specific software and the adapter needed to work with the latest ImageRunner boot roms. These are machines manufactured after 2000 and have a four digit model number (Example: IR5000). With this kit you can repair a corrupt boot rom or repurpose (change the function) of the part. You may also read a boot rom part and save the contents to a disk file plus more. Canon Kit#2 includes the programming unit, boot rom adapter plus the adapters and cables which attach to both serial and parallel counter assemblies plus ECO/ID boards. With Kit#2 you can repurpose and repair boot roms, copy and change count values, edit serial numbers plus move and change option settings. Kit#2 allows you to work with all counter assemblies including both 8 pin and 28 pin eeprom and fram devices. Everything you need is provided to attach directly to the chips which store count and serial number information. Also provided in this kit is our step-by-step tutorial which includes an actual memory (8 pin eeprom) preprogrammed with count and serial number data. The tutorial, using hands-on exercises, not only teaches you to use the system but also how find where count values and serial number information is stored. Using the tutorial you learn by doing before you begin working with actual machine assemblies. Canon Kit#3 is for counter and eco/id assembly work only. It is the same as Kit#2 without the boot rom adapter. Kit#3 includes the serial and parallel chip adapters, cables and clips to connect to both the 8 and 28 pin parts found on the counter and eco/id assemblies. The kit also includes the step-by-step tutorial with the preprogrammed serial eeprom. Note that all kits can be upgraded in the future to support additional capabilities by purchasing any optional adapter or option package separately. Optional boot rom adapter - Andromeda Resarch also manufactures a boot rom adapter (#AC8B72) for earlier ImageRunner machines. These machines have three digit model numbers such as IR300 or IR400. Canon Kit#1 includes the AR-32A programming unit, Canon specific software and the ACDM72A adapter which supports the latest ImageRunner boot roms. With this kit you can repair a corrupt boot rom or repurpose (change the function) of the part. You may also read a boot rom part and save the contents to a disk file. Canon Kit#2 includes everything you need to work with boot roms, counter assemblies and ECO/ID boards. Kit#2 includes the programming unit (#AR-32A) with software, the boot rom adapter (#ACDM72A), the in-circuit serial eeprom/fram adapter (#ASERSM1A) and the 28 pin parallel memory adapter (#ASOIC28/LV). Also included are the standard 8 pin surface mount clip for counter assemblies (#ASOIC8), the LC46 clip for ECO/ID assemblies (#ALC46) plus the surface mount probe set (#SMP8). Canon Kit#3 includes everything you need to work with counter assemblies and ECO/ID boards. Kit#3 includes the programming unit (#AR-32A) with software, the in-circuit serial eeprom/fram adapter (#ASERSM1A) and the 28 pin parallel memory adapter (#ASOIC28/LV). Also included are the standard 8 pin surface mount clip for counter assemblies (#ASOIC8), the LC46 clip for ECO/ID assemblies (#ALC46) plus the surface mount probe set (#SMP8) if a clip connection is not possible. HOW THE RICOH COUNTER KIT WORKS - The RICOH COUNTER KIT supports both 4 chip and 4+ chip counter assemblies found in many RICOH machines including the MPC6000 through 8000, MP6000 through 9000 and MP6001 through 9001. The kit works by allowing you to connect directly to each chip using the CABLE8/DD assembly surface mount clip. Once connected you use the system to read the data from the chips where you can edit the count values. You can also program the edited data back into the individual counter chip or copy a complete chip set to another assembly. The kit uses a custom spiked alligator clip which attaches to a specific point on the counter assembly. Attachment of the spiked clip enables the chips to be read in-circuit (without removal from the assembly).Once the spiked alligator clip is in place, the CABLE8/DD surface mount clip is attached to read/program the counter values. The RICOH COUNTER KIT includes everything you need to work with 4 and 4+ chip counter assemblies. 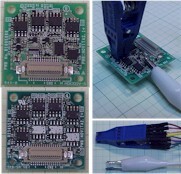 The RICOH kit includes the programming unit (#AR-32A) with software, the in-circuit serial eeprom/fram adapter (#ASERSM1A) and the SPI direct drive cable assembly (#CABLE8/DD) plus the custom spiked alligator clip and the step-by-step tutorial. The CABLE8/DD includes the surface mount clip which connects directly to the 8 pin counter memory chips. As the business climate has changed, Toshiba dealers find themselves in the position of needing to program (burn) their own eproms. Andromeda Research manufactures a complete programming system (AR-32A) plus optional adapters which address all Toshiba eprom programming requirements. Since not all dealers require the same equipment there are three different eprom sizes found in the Toshiba copier lines; 32, 40 and 42 pin parts. The most common Toshiba eprom encountered is the 27C4001. This is a 32 pin part and is directly supported by the EPROM+ system (no adapter required). If your needs require 40 or 42 pin eprom support you will require one or two optional adapters. 40 pin eproms require the #A40PE adapter. 42 pin eproms require the #A42PE adapters.html adapter. 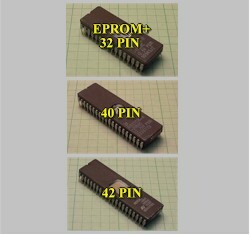 NOTE: Due to technology differences 40 pin eproms cannot be programmed in the 42 pin adapter. The images on the right have hot-spot links to the EPROM+ system (32 pin parts) plus the optional adapters. If you wish to reuse your existing, programmed eproms you may consider acquiring an eprom eraser. To create the correct programming package for your needs use the links or select from the items on the right. The SERIAL EEPROM TUTORIAL is included with any kit which allows you to work with counter or serial number data. The purpose of the tutorial is to teach you with hands-on exercises, not only how to use the system, but also how data is organized and stored in the memory part. The tutorial includes an actual 93C56 eeprom which is programmed with real counter and serial number data. When you perform the tutorial you learn by doing. You attach the system to the tutorial chip using the surface mount clip. You read the data from the chip and see it appear on the screen. 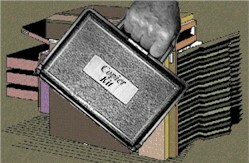 You locate and edit count and serial number data then program the data back into the part. The tutorial also teaches you how to use system commands. The goal is to make you an expert, not only in use of the system, but also how eeprom and memory parts work. After you have finished the tutorial you will be comfortable and ready to work with real copy machine counter and serial number assemblies.